All in all, I think I'm a pretty positive person. I'm pretty happy with my life, most times. We all, of course, have those times that are trying, or sad, or just damned hard. We all handle those times differently, as we should. We own them and they're ours to do with what we can. But. If you know me, you also know I get angry and tend to speak my mind about the things that I see as injustices. This piece was prompted by an email I received from a young woman I've gotten to know through the internet. She read "Whimsey," sent me a very nice email about how much she enjoyed it, and we've exchanged the occasional note over the past couple of years. I'm going to call her Jane. Jane confided in me that she had been writing since she was quite young and was working on a manuscript. She asked if there were books about writing that I would recommend, and it's just been that sort of on-line relationship - not "friends," but "friendly." And I like her. But a couple weeks ago I received a note from her that broke my heart. Jane had shared some of her writing with a close friend who proceeded to ridicule her efforts, and then told her she was delusional if she thought she was ever going to be an author. Jane was crushed, of course. Hurt, of course. And her self-confidence shattered. When she told me about this incident, she asked if I had ever had something similar happen and you know, I had to admit that yes, I had. Without going into all that, when Jane asked me what would I do, my advice was to keep writing, of course. And to write about this. This heartbreak - write about the hurt. Write it out. 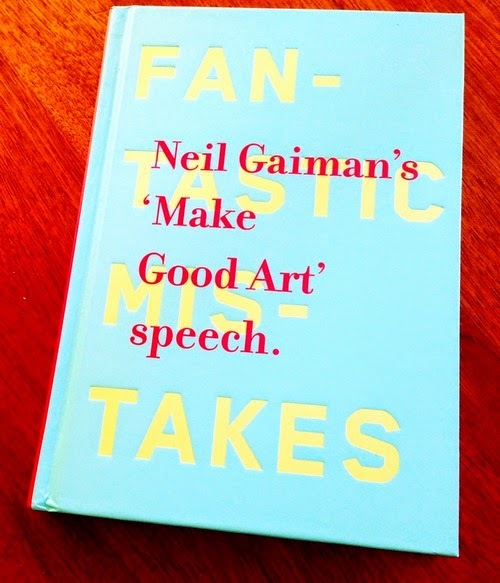 And I sent her a copy of Neil Gaiman's "Make Good Art Speech" book. I did not tell her we should perhaps look into hiring a hitman. In the meantime, I have fretted about Jane and the fact that she's had her heart broken by a "friend." And, I knew I had to write it out, just like I had advised her to do. This is the sort of thing that breaks my heart and makes me crazy. What is with someone who is capable of hurting someone this way? So, I vent. I vent by writing. It's the way I've vented since forever. I know you know exactly what I mean, and I'm betting most of you do the same thing. Write it out. Getting the bad things out by letting the feelings flow onto paper. It is amazingly cathartic. And not at all surprising that therapists will encourage their patients to do this very thing. And in case you haven't figured it out yet, there's a rant coming as I write it out. It struck a chord with women. It certainly struck a chord with this woman. It's a sentiment I try to live. Something I believe in. Something I love, admire and respect in other women who also embrace this attitude in their life's creed. Being the pragmatic, mouthy, prickly, outspoken soul that I am, I also believe the statement contains an unspoken caveat. And that is this - not all women deserve our help. I'm sorry if this offends some of you, truly, I am. But here's a fact as I know it. Mean girls we knew growing up, oftentimes have grown up to be mean women. Mean, competitive in a not so nice way, manipulative, and the scariest thing of all, is when they're capable of hiding these things behind a kind exterior with charm and phony grace wrapped firmly around their own agenda. You know them. Or, if you don't, God has blessed you because you are one lucky, lucky soul. Women who just don't "get" the importance of women friends. They might profess their support, only to slyly undermine your efforts behind your back. This is, of course, rooted in insecurities so deep that it's sad, really. And to be pitied, I suppose. I revel in the fact that because mean sly souls aren't as smart as they give themselves credit for and because true nature will always show itself, they're eventually found out. I know, I know. I sound cranky, paranoid and pretty insecure myself. To the Polyanna self that resides in my soul. I will cast aside the mean girls who grew into mean women. I will rejoice in the women who are strong enough to support other women who are deserving. I am thankful every single day that I have always had more of these in my life than the other. I will remember that these women are a blessing to be celebrated. Their numbers are many, may they multiply. May they teach us, so that we may in turn teach others. May we embrace one another's differences and praise one another's talents in their uniqueness. And let me, please, remember who they are - the good and the bad - so that I may praise the good, be one of their number, speak out on their behalf, and speak out against those who are not. And help me, please, be one of those who will continue doing what she can to support and help those who need it and deserve it. Dear Reds, I wish you all well. Always. It's lovely beyond words to be a part of this group where everyone so generously supports everyone else. Any of you have women they would like to praise, or a mean girl/woman story they feel like sharing? Let 'er rip. Write it out. How sad for your friend Jane that her "friend" couldn't be supportive and encouraging. Sometimes the doing is hard enough on its own; being castigated for the effort is devastating. May the mean girls/mean women be countered by kindness and may we never miss an opportunity to support each other. 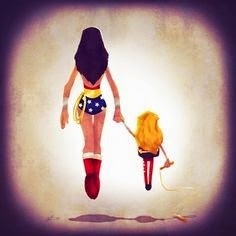 Love the Wonder Woman picture . . . .
Well said, Kaye. And good point about such "friends" being sly. I was once in a a critique group with such a woman and she did a lot of damage to several aspiring writers before we caught on. Funny thing was, she couldn't handle even constructive criticism of her own writing. After she left the group, we followed a simple rule: instead of saying "that's a really ugly baby" always say "your baby might be even prettier if . . ."
Thanks for reminding us to treasure our friends Kaye! I feel so lucky to be part of this funny, generous, smart gang of Reds...readers and writers both. I had a hard time deciding if I wanted to write this piece or not. So often, we just put on our blinders and keep our mouths closed about the mean women in order to not look like one ourselves. Joan and Lucy, I agree - When we have a good support group of other women, it's important I think to nurture it and treasure it. Kathy, I tell you. Sly they can be, right?? I'm glad you caught this woman out. Love your simple rule! I hope Jane told that "friend" to jump off a cliff, and I will contribute to the hit man fund. A person who belittles your efforts about *anything* is not a friend. Good rant, Kaye! I would add, from a personal perspective, that being pro-women does not mean being anti-men. Thank you, dear Kaye. It's funny… We expect people to be genuine and helpful, right? And it is so disconcerting and disturbing to realiZe someone has another agenda. Thanks so much for bringing this up… And for being such a good and thoughtful pal . The one thing I've learned about writing is that some people will never write well enough to be well published. HOWEVER! It turns out that no one can tell which ones they are. I've been astounded by how much some writers can improve. And if you get so discouraged that you give up, you'll never find out how good you can get. The first agent I sent a manuscript to (it was nonfiction) advised me not to write fiction because I didn't have the talent. She was an idiot. Ugh - that story about Jane is so awful. I cannot imagine saying such a thing. And yet, I can imagine it happening, too. Most of the "mean girls" I encountered were in high school. I've been fortunate enough to avoid them in my adult life - maybe because I learned to spot them? And perhaps this is why I'm so careful about who I let read my writing. It's gone from "I'm afraid of what I'll hear" to "You don't deserve to see what I've done." Maybe that's unfair, but there it is. mean girls! The world is full of them, spiteful, malicious, unwilling to give credit to someone other than themselves. I have wonderful critique partners and am very careful about "sharing" my WIP with anyone else. Ramona, you are exactly right - pro-woman does not mean anti-man (especially firemen who have a habit of forgetting their shirts). Hank, we do expect that of people. Some of us still do, even after we've lived through those incidents when people have disappointed and hurt us. I don't ever want to become a person who expects the worst of everyone, but I have learned to keep my guard up and truth be told, I just hate that. Hallie, the stories I've heard about some of the letters people have received from agents just makes my head explode. The very people who consider themselves experts who are capable of writing a letter to someone knowing full well that they're trampling on someone's dreams should be, I think, in a different line of work if they can't be kind. Be firm, of course. But kindness isn't that hard. Thelma, oh yes, there are absolutely mean men as well as mean women, sadly some of them hold our lives in their hands and that is one very, very scary thought. Mary, I love your philosophy about who deserves to read your work!! That is such a perfect way, I think, to look at it. Margaret, it's so hard to share that piece of ourselves and finding good critique partners is a blessing - good for you! Honestly, don't y'all think there's a special circle in hell for people who can trample on another person's dreams? Where I taught, a woman was hired -- she appeared to be very friendly, capable, supportive -- she specifically complimented people. But she also very cunningly undermined people, finding each of our vulnerable spots. I worked with her for several years, frequently hurt by her barbs, but mainly keeping my feelings private. The day the principal announced that this woman would be leaving, all over the building, people cheered. The young teachers went out for beers; my phone rang off the hook. She had been treating everyone the way she treated me -- quietly inserting her digs. A tough lesson learned. Denise - Cunning! YES! Man, I hate that. I'm glad her evil self was finally exposed and I have to believe that is always the way it's going to be. I'm sorry you went through this. Learning life's lessons shouldn't be so hard. "She was an idiot". Indeed. These chronologically grown up, but stunted emotionally, women very often exhibit idiotic behavior. Certain female (and male, thank you for pointing that out, Thelma) politicians have taken the "mean girl" act to a much different level, unfortunately. To me, the term mean girl is the distaff version of bully. It's the emotional equivalent: an insecure person who cannot support others, whether out of jealousy or some other emotion, so instead they have to tear them down in some way. Who has the energy to deal with that nonsense? It's their stuff, not ours. That's what we have to remember. So on the mark, Kaye! The person who stands out for me was a mean guy. He had an absolute talent for finding the most vulnerable point of each person he met, then going for the jugular. We were in the field, he riled up people so calm and friendly normally, you just stood with your mouth open. Had the crew mutinied, hit him over the head with a shovel, I'd have helped dig his grave! On the positive side, I'd like to share my first reader--my mom. She read every faltering poem, every short story, every aborted novel beginning. It was her willingness to read what I'd written, her joy in the written word that inspired me to keep trying. Even with a house full of kids (8 of her own), critters, cousins, and neighbor kids, she always gave me time. Karen, bullies, yes. Covered in a coat of phony spun sugar. And we do need to remember that the nastiness is their issue, not ours, I agree. And once we pick ourselves up from the hurt they've inflicted, remember it and protect ourselves with it. FChurch, your mom sounds like everyone's dream mom. And she he raised a good woman. Nice wins every time. Kaye, thank you so much for this post. I'm glad your friend Jane had you in her corner. As Madeleine Albright said, "There's a special place in hell for women who don't help other women." aw, Susan, thank you! And wish Mattie Happy Birthday for me, please!! Mary Sutton... so it WAS something I said? I'm Delighted to hear! "You'd be so pretty if you lost fifteen pounds!" "If you didn't waste your time on painting, you could have a real job." "How could you possibly leave your sweet baby in some soulless day care?" People who are confident and happy with themselves want others to be confident and happy. People who are not...are Jane's "friend." Sly is another word for passive aggressive. Those people should be avoided at all costs... Unless of course you can afford a hitman (fictional variety can be very therapeutic). I'm rereading Margaret Atwood's Cat's Eye for inspiration for a mean girl who will feature in my third mystery. Her novel is pretty definitive on the subject. I love you with my whole heart. I get discouraged. Either the internal saboteur or the external one. Sending support to anyone brave enough to try to write. Sorry I went MIA for awhile. I'm reading an ARC of Chevy Stevens next book, THOSE GIRLS, and Holy Kittens - it kidnapped me!!! wow and wow and wow. Julia, you are absolutely right. But the difference, for me anyway, is that there really hasn't ever been a man with the power to hurt me the way a girlfriend has. I guess I've always retained a little of "myself" when it comes to men, that I haven't when it's come to girlfriends. Jaye, no no no - don't ever get so discouraged that you give up. Small steps will get you where you're going. Small steps and deep breathing and a look in the mirror every day to say, "Yep. I can do this." you can. First, let me say how wonderful it is that you have befriended this woman and shown her support, even sending her the Neil Gaiman book. Your support of her is one of those shining moments of women passing it on, woman to woman cheering each other on, as it should be. I know I shouldn't be surprised by my age, but mean women are still a shock to me. I don't have a particular story to share, but I have heard remarks from women to women that are meant to make the other feel small. Why would someone want to make another person feel small or without value? My women friends are awesome warriors in my life of surviving the bad and major party noise makers in the good and glorious. And, the women here on Jungle Reds are the best examples of magnanimous females, at the ready to applaud and console, to offer a helping hand or a word of wisdom or share a laugh. Of course, the men here are awesome, too. Thanks, Kaye for reminding us of the importance of sisterhood in navigating our way through life. Oh, and the Wonder Woman picture is very cool. Surely one of the little perks of being a writer is the opportunity to follow the old advice"Don't get mad, get even." Put them in a book and you don't go to jail for it! Kathy, this young woman will be the kind of person who will "pay it forward," I think. Who knows where Neil Gaiman's book might find itself next? And I love that. It was a small gesture of support. Plus, you know how great it feels to introduce someone to a book you love, so it was a feel good thing for me too. Triss, LOL - yes, there IS that! Always. Write on, Kaye! You go, girl! Tell Jane to keep on writing, too. I grew up among people who made themselves feel better by denigrating others, and I HATE them. Get rid of the mean women in your life. Kaye, how wonderful that you were in her life to provide the support she needed. I was fortunate to have avoided mean girls until just recently, and fortunate to have a friend who helped me extricate myself. I'm wondering now if they were there all along but I was too goal-focused to give them any attention, or any power to harm. I don't understand that need to hurt. One of my happiest teaching memories is a young woman saying I had shown her that she could express herself in writing just as she did in dance. She was temporarily on the injured reserve for dance, but had just written a very personal and heart-felt essay expressing the contrast between her safe and comfortable life and tragic news on TV. May we all help each other find our best selves. Hallie, yes. You signed an ARC of There Was an Old Woman at Bouchercon 2012. I mentioned I was a writer, or at least trying to be one. "Don't let anyone tell you to give up," you said. You probably don't even remember the conversation - but I do.